The parking garage contract is non-transferable and is to be used only by those listed on the contract. The permit is the property of The University of Texas at Austin and must be surrendered upon request. The access card is the responsibility of the contract holder, however rights regarding activation or deactivation of the access card remain with the parking garage. After the initial 1st month of use, replacement of the access card, for any reason, is $10. Contract holder assumes full financial responsibility for any misuse of the parking access card in regards to garage parking. The parking access computer will be the sole means of determining access card status. Any entrance into the garage other than by the parking garage access card may require you to pay the corresponding daily rate. Never drive through an open gate UNLESS ALL GATES ARE OPEN and you have no other option. If all gates are open your card will automatically be resynched. At any other time, if your card should become out of synchronization you may be subject to a $15 resynchronization fee. Do not take a ticket, as you may have to pay the daily rate. Permits need to be displayed by the hangtag from the rearview mirror or placed on the lower center section of your windshield. Owners of vehicles not displaying a valid permit are subject to non-dismissible tickets. Permit replacements are $20. Garage permit renewals are the responsibility of each permit holder. Failure to renew the permit, for any reason, is the sole responsibility of the permit holder and may result in the loss of the permit. All deadlines are final. Renewal notifications are sent as a courtesy only and failure to receive the notification, for any reason, does not alleviate the permit holder of the responsibility to renew the permit by the deadline. Garage permits must be renewed at each opportunity to maintain the renewal status of the permit. There are no spring to fall renewals. LEVEL RESTRICTIONS of the garage apply only to "R" permit types. These restrictions are in effect from Monday morning at 6 a.m. until Friday afternoon at 5 p.m.
27th Street Garage - Level 4 and above. There are no level restrictions for F and S permits or for those utilizing daily parking in the garages. The S permit is not intended for 24-hour storage of your vehicle. Should you need to keep your vehicle in the garage longer than 72 hours, please contact the garage office for overnight authorization. Contract refunds will be prorated on a scale established by UT Austin Parking & Transportation Administration. Established rates available upon request. Any misuse of the access card or permit will result in forfeiture of your contract, a letter to the dean, and a police report. We reserve the right to cancel, without refund, any parking garage contract. 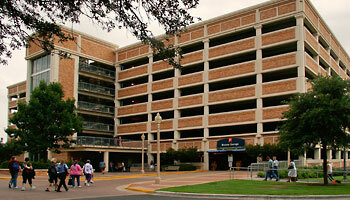 All UT-Austin Parking & Transportation Rules and Regulations apply to contract holders. No car may be towed without advanced written permission from the vehicle owner. If at any time you fail to meet the qualifications for the particular contract you hold, the contract is subject to cancellation. Anyone utilizing a University of Texas at Austin parking garage does so with the express understanding and agreement that The University of Texas assumes no responsibility for losses by fire, theft, collision, or otherwise, to any vehicle or its contents. We reserve the right to close/block exits and entrances at any time to accommodate large crowds and provide a safe atmosphere for garage patrons and pedestrians. We also reserve the right to relocate permit holders as needed.